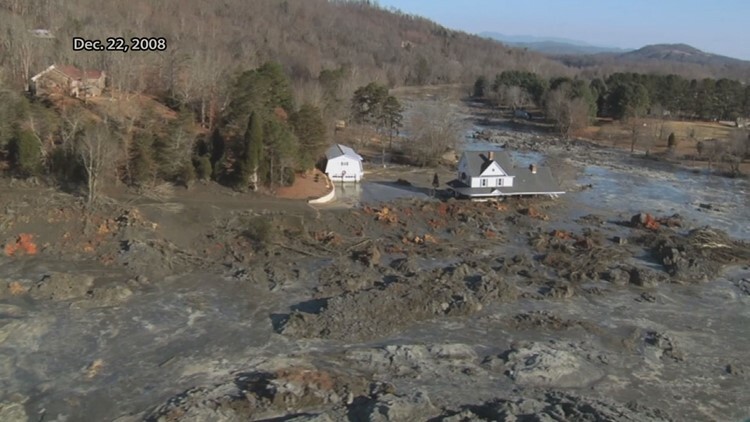 Millions of cubic yards of wet ash spilled across the countryside and into the nearby Clinch and Emory rivers. It was one of the largest manmade disasters in U.S. history and resulted in a $1.2 billion cleanup and recovery cost. Knoxville — A federal jury cleared the way Wednesday for former workers to seek damages against a company that oversaw cleanup after the 2008 Kingston coal ash disaster. The panel effectively agreed Jacobs Engineering should face a trial because they subjected workers to exposure from toxic coal ash wastes released Dec. 22, 2008, when a holding cell collapsed at TVA's Kingston Steam Plant. The waste represented the burn-off left over from coal used to fuel the plant. The TVA is considering changes to the way it stores its coal ash, following a major ash spill in 2008 in Kingston. Workers hired to help clean up the site allege they were unknowingly exposed to carcinogenic materials that sickened and caused death in some. Jacobs Engineering said the company closely monitored levels of toxic chemicals at the site. It says the levels were never high enough to cause injuries. In reaching their verdict Wednesday, jurors had to answer three questions. First, they were asked whether Jacobs "failed to adhere to the terms of its contract with TVA, or the requirements set forth in the sitewide safety and health plan for the Kingston site." They signaled their affirmation with a "Yes" checkmark. They then were asked if Jacobs had failed by a preponderance of the evidence to "exercise reasonable care in carrying out the duties that it owed" to the workers. Again, they answered with a "Yes" checkmark. Lastly, they were asked to if they'd found by a preponderance of the evidence that Jacobs' failure to honor its duty could have caused a series of health problems that ranged from hypertension to lung cancer to leukemia to skin cancer to asthma to chronic obstructive pulmonary disease to respiratory conditions. They answered with a "Yes" checkmark to all. Wednesday's decision represents the first of a two-phase process. Now a jury will be impaneled to determine at trial what if any damages Jacobs Engineering, hired by TVA to oversee the cleanup, should face. That trial likely won't take place until 2019. Jurors worked about three weeks before Wednesday's verdict, hearing testimony from former workers, experts and current and former Jacobs employees. They began deliberations Tuesday. Chief U.S. District Court Judge Tom Varlan presided over the trial in Knoxville.